Lee Marrs is an Emmy Award-winning art director who entertained her fellow students K-12 with caricatures of her teachers, the coach, anyone of authority. She discovered pen and ink while visiting New Orleans at age 12 and chiaroscuroed everything and everyone in sight for decades. She was told she had to decide which career to pursue: writing, cartooning or fine art. She did them all + animation. As a TV graphic artist and later Art Director for WTOP-TV, the CBS affiliate in Washington, DC, Lee began the parallel work pattern that has continued her whole career: assisting Tex Blaisdell with Lil” Orphan Annie and Prince Valiant comic strips; illustrating for The Washington Post and The Saturday Review ; and fruitlessly banging her head aqainst rampant east coast sexism. TV work introduced her to animation. Moving to San Francisco, Lee art directed several documentaries for Francis Ford Coppola’s American Zoetrope Co. As a partner/editor of Alternative Features Service, a feature news syndicate, she provided artwork for underground and college newspapers internationally. She’s author and artist for over a hundred comic books from the underground publishers, DC Comics, Dark Horse and Marvel Comics Group – for such characters as Pudge, Girl Blimp, Batman, Wonder Woman and Indiana Jones. A 1982 Inkpot Award winner, she’s been reprinted in Japan, Canada, England, Portugal, France, India, Finland, Sweden, and Germany. She ran Lee Marrs Artwork, an art/animation company for TV, feature films, computer games, and the web. Her clients have included Apple Computer, IBM, Electronic Arts, Atari, Time Warner Inc., Disney/ABC, Wonder Woman Foundation, KQED-TV S.F., KPIX-TV S.F., KNBC-TV L.A., Children’s Television Workshop, Nickelodeon, and MTV. Meanwhile, she served as Director of Animation for Video Paint Brush Ltd. in Australia and later was Studio Art Chief for the games designer, The 3DO Company. With a 2005 Master’s in Multimedia, Lee’s been the Animation Program Chair at the Center for Electronic Art; taught for SFSU Multimedia Studies Program, UC Extension, Cal State East Bay, Laney College; and lectured at UC Berkeley. She became Multimedia Co-Chair at Berkeley City College in 2007. Bruce "Chic" McKenty is manager of the American Lake Veterans Golf Course. He is a retired Army officer and a retired general contractor. Bruce graduated from Texan A&M University where he earned his commission as a 2nd Lieutenant in the U.S. Army Field Artillery. He received his Officer Basic Course at Fort Sill, OK and then went on to flight school at Fort Wolters, TX, Fort Rucker, AL and AH-1G Cobra transition in Savannah, GA in route to his first assignment, Vietnam. He was assigned to F Troop, 1/9th Calvary, 1t Calvary Division at Bien Hoa as an AH-1G Cobra attack helicopter pilot. He was wounded twice and has the unique distinction of being one of a small handful of Army helicopter pilots to survive after being shot down by an SA-7 heat seeking missile . He was awarded the Distinguished Flying Cross, Bronze Star, Two Purple Hearts and numerous Air Medals with two being awarded for valor. Bruce went on to spend 21 years in the Army serving in various assignments in Field Artillery and Aviation, and retired in 1991 as a Lieutenant Colonel. He earned a Master of Science degree from the University of Southern California in 1984 and in 1986 graduated from the U.S. Army Command and General Staff College at Fort Leavenworth, KS. He went on to become a general contractor in the greater Seattle/Tacoma area until his final retirement on 2001. In 2004, Bruce became a very active and enthusiastic volunteer at the American Lake VA golf course. He is also very active in the Military Order of the Purple Heart. He is currently the Northwest United States Commander of this organization and in this capacity he assists the National Commander in supervising the operation of the Order from Alaska to the Dakotas. He is also extremely active at the local and state level as the adjutant and Finance Officer of his local chapter and as the Finance Officer and Service Officer at the state level. Before becoming the Region Commander he was the State Commander for three years. Bruce manages to be able to stay deeply involved in helping veterans through his leadership in the Military Order of the Purple Heart, his position as Manager of the American Lake Veterans Golf Course and as a Board Member of the Friends of the American Lake Veterans Golf Course. Brigadier General Edward R. Langston, Jr., formerly served as the Deputy Assistant Secretary of the Navy, Research Development & Acquisition, Expeditionary Forces Programs, The Pentagon, Washington , D.C.
General Langston graduated from the United States Naval Academy and was commissioned a second lieutenant in June 1969. General Langston also holds a Master of Science Degree in Business Management from Salve Regina College and a Masters of Arts Degree in National Security and Strategic Studies from the Naval War College . He has attended The Basic School, Naval Command and Staff College , and the Air War College . In 1970, he attended the Army Aviation Rotary Wing Class, Fort Wolters , Texas , and Fort Rucker , Ala. , and was designated an Army Aviator in September. First Lieutenant Langston transitioned into the UH-1E at Camp Pendleton , Calif. , and was designated a Naval Aviator on January 1, 1971. Joining the first Marine Aircraft Wing at Marble Mountain , Republic of Vietnam , he was assigned to fly with HML-167. In January 1972, First Lieutenant Langston was transferred to HT-8 at NAS, Ellyson Field, Pensacola , Fla. Serving as a Primary Helicopter Instructor in the TH-57, he held the billet of Standardization Officer and NATOPS Officer. In April 1975, he was assigned as the Helicopter Standardization Officer, Training Wing Five, NAS, Whiting Field, Pensacola . During May 1976, Captain Langston was assigned to Marine Helicopter Squadron One in Quantico , Va. While at HMX-1, Major Langston was designated an Aircraft Commander in the CH-53D, CH-46F, and the VH-3D. He served in a variety of billets in the operations and maintenance departments and was designated a Presidential Command Pilot in 1979. Following a tour as the Safety Manager and NATOPS Officer of MAG-36 in Futenma, Okinawa, Major Langston was transferred to the First Marine Brigade and assigned to HMH-463 where he served as the Administrative Officer, Operations Officer, Executive Officer and, from May 1984 to June 1985, the Commanding Officer. In May 1986, he was promoted to lieutenant colonel and reported to Headquarters Marine Corps where he served as Section Head, Exercise Branch within the Operations Division from July 1986 until July 1988. Following a tour as the Executive Officer at The Basic School, he returned to HMX-1 as the Executive Officer and assumed command of the squadron in May 1991. He served as the Commanding Officer of HMX-1 and as the President's helicopter pilot from May 1991 until June 1993. Following a tour as the 1st Marine Aircraft Wing Inspector, he was transferred to the 2d Marine Aircraft Wing, Cherry Point , N.C. , where he served as the Chief of Staff. After his selection to Brigadier General, he served as the Deputy Commanding General, I Marine Expeditionary Force, Camp Pendleton , Calif. During May and June of 1997, he also served as the Commanding General of the 1st Force Service Support Group. He retired from active duty on 1 Aug 00 after serving three years as the DASN(EFP). General Langston's decorations include the Distinguished Service Medal, Legion of Merit; Air Medal with 12 Strike Flight Awards; and the Presidential Service Badge. A graduate of Rhodes College in Memphis , Gayle took a year off between her Sophomore and Junior years and worked first as a newspaper reporter for a small Mid-South weekly. She wrote the local articles, laid out the front page, and took the pictures with an old Polaroid camera. About the only thing she didn't do was deliver the stupid thing every Thursday. This was in the pre-computer, pre-digital camera, pre-Internet era. Gayle followed that job with a stint as a private detective working for Mark Lipman Service Incorporated out of Memphis . She traveled to various locations around the country like Atlanta , Chicago , and Little Rock . She worked undercover on an assembly line, in a clothing factory, and in a printing company. As her female protagonist, Ginger Caulfield, says in the book, "It's amazing how much people will tell you when they don't know they're being questioned." She has worked as a draftsman, in a bookstore, made miniatures for a doll house shop, and then spent a decade in a bank learning about stocks and bonds before she "retired" to continue her writing full time. It was that bank experience that led to her writing Hedge Bet. Upcoming books in the "Gin Caulfield Mystery Series" will take other real-life situations and wrap a mystery around them. That's where good stories come from. Gayle's spy novels are dear to her heart. Her dad was an officer and pilot in the United States Air Force. He served during WWII, Korea , and through part of the Vietnam War and the Cold War. He flew C-47s and C-130s. Attached to the 66th Tactical Reconnaissance Wing when the family lived in France , his planes took aerial reconnaissance photos (read: spy photos). Gayle used both her father's as well as her own background to write the spy novels which are still in the editing phase. Was her father a spy? You know real spies never tell. Gayle does have a letter from J. Edgar Hoover accepting her as a GS2 in the FBI, but she already had the P.I. gig at the time, so she said she turned him down. The historical facts in the spy stories are from books, magazines, and newspaper articles. Many of the locations are places she actually lived when her father was in the service. They lived on Okinawa, in France , and toured Europe and parts of the Far East . Her parents traveled to Russia , China , South America , Greece , through the Panama Canal, and into Canada . Many of those travels are in the books. Actual events are interwoven with the fictional stories. Sometimes you can't tell where truth ends and fiction begins. Gayle graduated from a boarding school in France ( Dreux American High School ) and received a Bachelor of Arts degree from Rhodes College in Memphis , majoring in Fine Arts. She paints, builds miniature doll houses, and makes hand-made Santas and other crafts. Her Christmas stories are filled with photographs of things she made just to illustrate the books. See Bearnard's Christmas for an example of her work. Gayle's husband, Richard J. Pool, is the basis for Gin's husband, Fred, in "The Ginger Caulfield Mysteries." They have shared their home with various dogs and cats, all strays, and each one special. Four of them make guest appearances in her first holiday story, Bearnard's Christmas. She collects Santas (over 3000), Christmas ornaments, Halloween decorations, Easter items, Fourth of July decorations, roosters, and just about everything else, space permitting and husband willing. She is a member of both Sisters-in-Crime and Mystery Writers of America. She was on the board of Sisters-in-Crime/ Los Angeles as their Speakers Bureau Director, doing over 71 events, she initiated their workshop program, and worked on the last No Crime Unpublished conference sponsored by SinC/LA. She was one of the founding members who brought together Mystery Writers of America and Sisters-in-Crime for their inaugural joint conference called the California Crime Writers Conference in June of 2009. 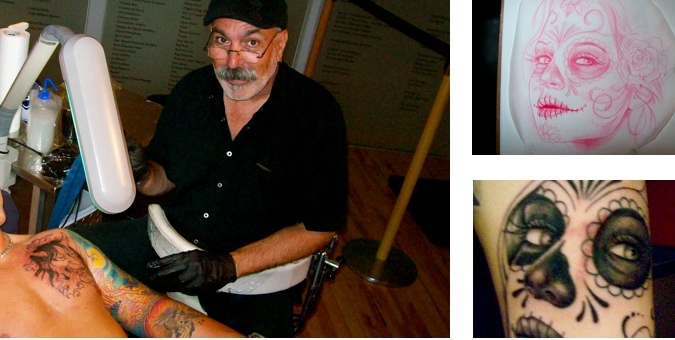 Casey Davis has been tattooing for nearly 25 years. He started his tattooing career in Alaska with a traditional apprenticeship. As he had an extensive art background he quickly excelled and had an opportunity to move to Vancouver to further his work. Casey has tattooed extensively in countless conventions and guest artist spots in North America and Europe. He also worked at their sister shop in Switzerland. Casey worked at Smilin’ Buddha for a number of years before opening Living Color in Calgary which he ran for nearly 13 years. He continues to tattoo in Calgary and makes a monthly trip to tattoo his clients in Whitehorse. Casey believes that a good tattoo, no matter how simple should still adhere to the basic principles of perspective, positioning, spacing, the proper use of light and shadow, color and tone. A good work of art must have balance.